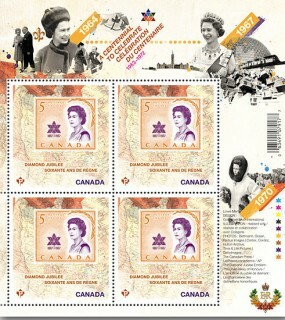 I can’t speak for the Queen, but I can say that I was not amused with the new exhibition at the Canadian Postal Museum marking Her Majesty’s Diamond Jubilee as monarch. Said museum is a step-child of sorts — think of poor Cinderella — of the Canadian Museum of Civilization and is located, way at the back, within that huge building in Gatineau. I visit the postal museum frequently, having developed a love of stamps during my childhood. I gave up stamp collecting eons ago but I still have a soft spot for the little sticky things and, I confess, for the monarchy. So, it was with much eagerness that I went to visit the newly opened exhibition of 645 stamps, bearing the Queen’s likeness, collected from around the Commonwealth during the last 60 years. The stamps were well chosen, many from outposts of the Empire one rarely ever hears mentioned on the news, the exception being the Falkland Islands that are still coveted by Argentina despite having already lost a war over the south Atlantic bits of rock largely inhabited by sheep. There were, for example, stamps from Pitcairn Islands, infamous home of the descendents of the mutineers from The Bounty. 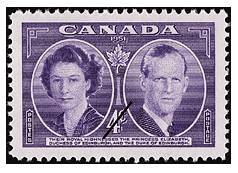 One of their stamps showed a double portrait of the Queen and Prince Philip issued at the time of their 25th wedding anniversary. Lo and behold, there was the same stamp from St. Helena, Turks and Caicos, St. Lucia, Seychelles, and St. Vincent. It appears all these British dots on the map have banded together to save money on producing stamps. 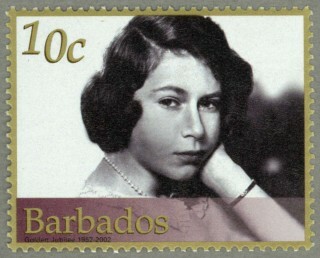 Ascension Island was represented by, among others, a series of five stamps starting with a baby picture of Elizabeth, valued at seven pence, rising in value and age of the monarch to a one-pound stamp showing Her Majesty as a mature adult. There were plenty of other gems. Too bad I couldn’t see them properly. Now, I just got a new pair of glasses so there is nothing wrong with my vision. But the lighting was so bad and the angle of the glass covering the tiny stamps was such that it was almost impossible to make out the name of the country, or even the value, of most of the stamps. After a few minutes of trying to examine the stamps, I got a headache and fled. It would have been helpful if there had been a magnifying glass on hand. (If there was one, I couldn’t find it.) Or there could have been a few enlargements posted on the wall so one could savour the portraiture and stamp designs more easily. 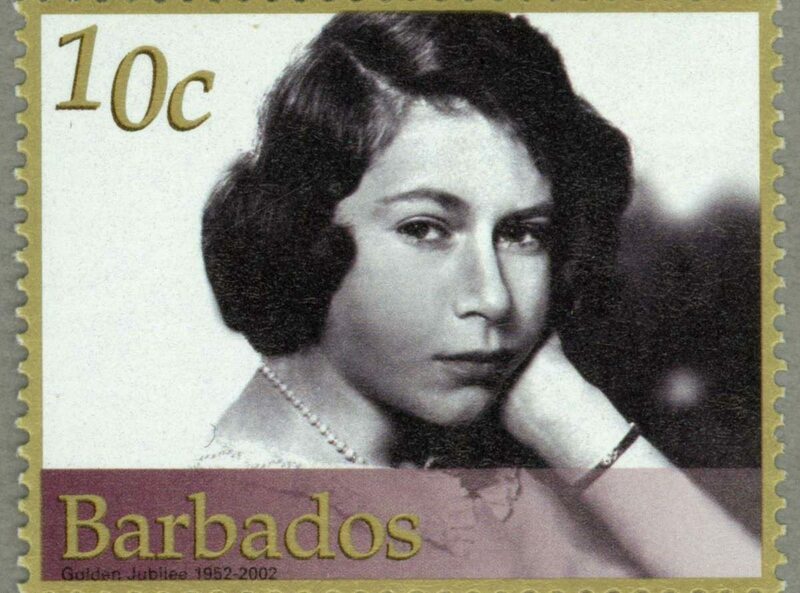 As well, the museum could only offer one stamp enlargement for publicity purposes: The lovely Barbados stamp shown here with a teenaged Elizabeth. 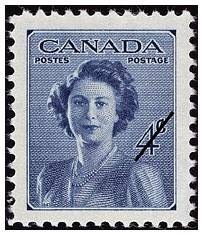 The other stamps shown here were supplied to us from Canada Post and may or may not be in the exhibition. In announcing the exhibition, the Postal-Civilization museum even offered some kind words from Heritage Minister James Moore about the show. It’s not routine for the museum to include comments from the minister in exhibition announcements. So, why this time? Really? Has Moore actually seen this “fitting tribute”? Moores’s comments presumably will be coming soon as well.